Durham Boat Company is more than just an equipment provider, we are a full service shop. In addition to the world-class products we offer, we also provide facilities, both on the water and indoor instruction and detailed technical analysis for rowers and scullers of all levels. Durham Boat Company’s Sculling School offers lessons on the Lamprey River to all interested scullers, from novices to accomplished competitors. Anyone taking lessons will be short term members of the Durham Boat Club during the time period of participation in lessons or rentals. The season begins on or around May 28h and continues until October 11th. 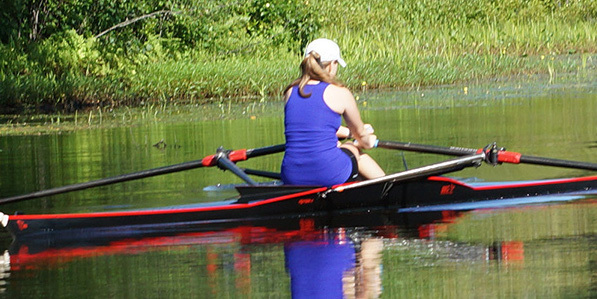 As every rower knows, there are two critical components involved in a rowers performance: their fitness (or in other words their ability to generate work) and their technique. Both are necessary and critical to the performance. Over time our understanding of how to produce fitter athletes with a great capacity to generate work has improved and our training methods have evolved. However, our approach to technique has remained relatively the same since the beginning of our sport. Athletes are provided feedback by a coach in a very subjective manner without a large amount of supporting data beyond a stop-watch or GPS unit. Technology though has now caught up with our sport and is quickly changing the landscape. Durham Boat Company now carries the Rowing Performance system by Quiske allowing athletes to develop a better understanding of their rowing. For over 10 years we have been compiling Force Measurement Data on single and double scullers of various skill levels including some of the top elite scullers in the country and the world to understand how best to improve synergy of power application and in the last few years have been doing the same in our indoor rowing tank with great success. We have used the FM System with everyone from beginners to elite level athletes. The data allows coaches and athletes to view the force curve, stroke length, slip on each end of the stroke, watts of power produced per side (sculling) or per station (sweep), strokes per minute, handle speed and more.